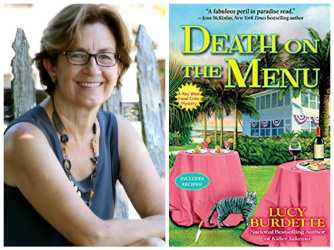 Please join us on Tuesday, April 23 at 6 pm to hear author Lucy Burdette talk about her Key West Food Critic Mystery series. Her latest book is Death on the Menu. After her talk, Lucy will be happy to sign copies of her book. Clinical psychologist Lucy Burdette (aka Roberta Isleib) has published 16 mysteries, including the latest in the Key West food critic series, Death on the Menu. Her books and stories have been short-listed for Agatha, Anthony, and Macavity awards. She's a member of Mystery Writers of America and a past president of Sisters in Crime. She lives in Madison CT and Key West FL. Hayley Snow's life always revolved around food. But when she applies to be a food critic for a Key West style magazine, she discovers that her new boss would be Kristen Faulkner-the woman Hayley caught in bed with her boyfriend! Hayley thinks things are as bad as they can get-until the police pull her in as a suspect in Kristen's murder. Kristen was killed by a poisoned key lime pie.